Speculative execution side-channel attacks like Spectre are a newly discovered security risk for web browsers. A website could use such attacks to steal data or login information from other websites that are open in the browser. To better mitigate these attacks, we're excited to announce that Chrome 67 has enabled a security feature called Site Isolation on Windows, Mac, Linux, and Chrome OS. Site Isolation has been optionally available as an experimental enterprise policy since Chrome 63, but many known issues have been resolved since then, making it practical to enable by default for all desktop Chrome users. This launch is one phase of our overall Site Isolation project. Stay tuned for additional security updates that will mitigate attacks beyond Spectre (e.g., attacks from fully compromised renderer processes). In January, Google Project Zero disclosed a set of speculative execution side-channel attacks that became publicly known as Spectre and Meltdown. An additional variant of Spectre was disclosed in May. These attacks use the speculative execution features of most CPUs to access parts of memory that should be off-limits to a piece of code, and then use timing attacks to discover the values stored in that memory. Effectively, this means that untrustworthy code may be able to read any memory in its process's address space. Site Isolation is a large change to Chrome's architecture that limits each renderer process to documents from a single site. As a result, Chrome can rely on the operating system to prevent attacks between processes, and thus, between sites. Note that Chrome uses a specific definition of "site" that includes just the scheme and registered domain. Thus, https://google.co.uk would be a site, and subdomains like https://maps.google.co.uk would stay in the same process. Chrome has always had a multi-process architecture where different tabs could use different renderer processes. A given tab could even switch processes when navigating to a new site in some cases. However, it was still possible for an attacker's page to share a process with a victim's page. For example, cross-site iframes and cross-site pop-ups typically stayed in the same process as the page that created them. This would allow a successful Spectre attack to read data (e.g., cookies, passwords, etc.) belonging to other frames or pop-ups in its process. When Site Isolation is enabled, each renderer process contains documents from at most one site. This means all navigations to cross-site documents cause a tab to switch processes. It also means all cross-site iframes are put into a different process than their parent frame, using "out-of-process iframes." Splitting a single page across multiple processes is a major change to how Chrome works, and the Chrome Security team has been pursuing this for several years, independently of Spectre. The first uses of out-of-process iframes shipped last year to improve the Chrome extension security model. A single page may now be split across multiple renderer processes using out-of-process iframes. 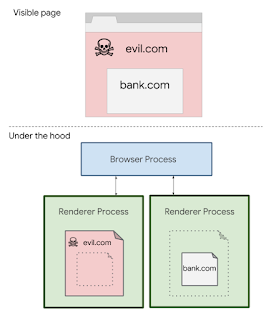 Even when each renderer process is limited to documents from a single site, there is still a risk that an attacker's page could access and leak information from cross-site URLs by requesting them as subresources, such as images or scripts. Web browsers generally allow pages to embed images and scripts from any site. However, a page could try to request an HTML or JSON URL with sensitive data as if it were an image or script. This would normally fail to render and not expose the data to the page, but that data would still end up inside the renderer process where a Spectre attack might access it. To mitigate this, Site Isolation includes a feature called Cross-Origin Read Blocking (CORB), which is now part of the Fetch spec. CORB tries to transparently block cross-site HTML, XML, and JSON responses from the renderer process, with almost no impact to compatibility. To get the most protection from Site Isolation and CORB, web developers should check that their resources are served with the right MIME type and with the nosniff response header. Site Isolation is a significant change to Chrome's behavior under the hood, but it generally shouldn't cause visible changes for most users or web developers (beyond a few known issues). It simply offers more protection between websites behind the scenes. Site Isolation does cause Chrome to create more renderer processes, which comes with performance tradeoffs: on the plus side, each renderer process is smaller, shorter-lived, and has less contention internally, but there is about a 10-13% total memory overhead in real workloads due to the larger number of processes. Our team continues to work hard to optimize this behavior to keep Chrome both fast and secure. How does Site Isolation help? In Chrome 67, Site Isolation has been enabled for 99% of users on Windows, Mac, Linux, and Chrome OS. (Given the large scope of this change, we are keeping a 1% holdback for now to monitor and improve performance.) This means that even if a Spectre attack were to occur in a malicious web page, data from other websites would generally not be loaded into the same process, and so there would be much less data available to the attacker. This significantly reduces the threat posed by Spectre. Because of this, we are planning to re-enable precise timers and features like SharedArrayBuffer (which can be used as a precise timer) for desktop. What additional work is in progress? We're now investigating how to extend Site Isolation coverage to Chrome for Android, where there are additional known issues. Experimental enterprise policies for enabling Site Isolation will be available in Chrome 68 for Android, and it can be enabled manually on Android using chrome://flags/#enable-site-per-process. 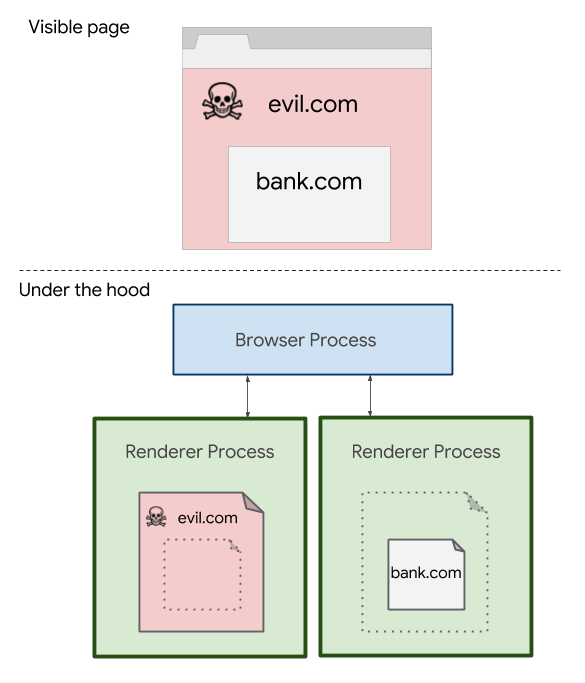 We're also working on additional security checks in the browser process, which will let Site Isolation mitigate not just Spectre attacks but also attacks from fully compromised renderer processes. These additional enforcements will let us reach the original motivating goals for Site Isolation, where Chrome can effectively treat the entire renderer process as untrusted. Stay tuned for an update about these enforcements! Finally, other major browser vendors are finding related ways to defend against Spectre by better isolating sites. We are collaborating with them and are happy to see the progress across the web ecosystem. We offer cash rewards to researchers who submit security bugs through the Chrome Vulnerability Reward Program. For a limited time, security bugs affecting Site Isolation may be eligible for higher rewards levels, up to twice the usual amount for information disclosure bugs. Find out more about Chrome New Feature Special Rewards.